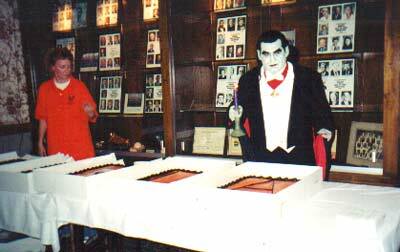 The 2000 Monster Bash featured Guests of Honor Bela Lugosi Jr., Jane Adams, Dwight Frye Jr., Bob Burns, Tom Savini, Gary Don Rhodes, Monster Bash make-up artist Ron Chamberlain and many more. It was a tribute to Bela Lugosi and his films! 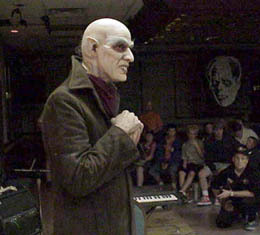 Kevin Slick brought the Bash Opera House down again, this time as Nosferatu as he performed live his new score for the NOSFERATU (1922). Thank you attendees, dealers and staff! 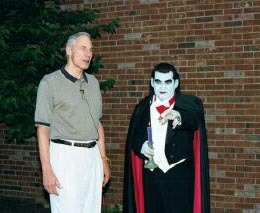 Bela Lugosi Jr. and a shorter, but effective Dracula (Ron Chamberlain)! Comic book artist, film monster designer and editor of Monster Kid On-Line magazine - Kerry Gammill. 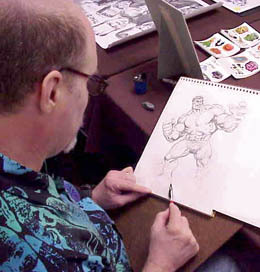 Here working on a sketch of The Hulk at Bash 2001! 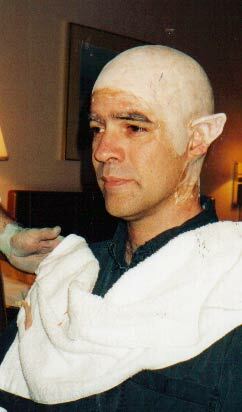 Soundtrack composer Kevin Slick begins his transformation under the hands of make-up artist Ron Chamberlain! 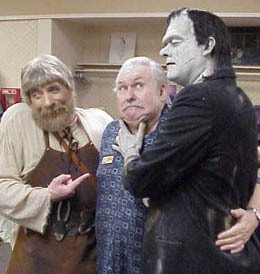 Mike Thomas as Ygor, Bob Burns as Bob Burns and Frank Rios as Frankenstein's monster (make-up by Ron Chamberlain). Bashers Supreme! 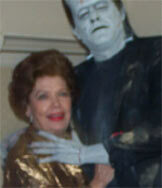 Jack and Ellen Linendoll with Bela Frankenstein in the "horror hotel" lobby! 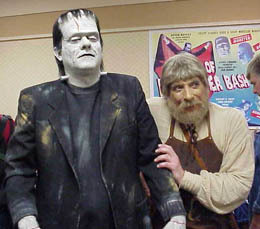 The monster and.....friend, Ygor, Bashing at Monster Bash 2001! 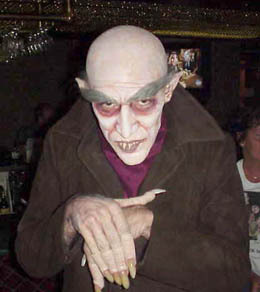 Bela Lugosi Jr. relaxes outside the Bash hotel! 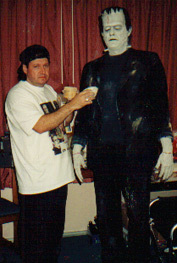 Monster Bash make-up artist Ron Chamberlain creating a monster! 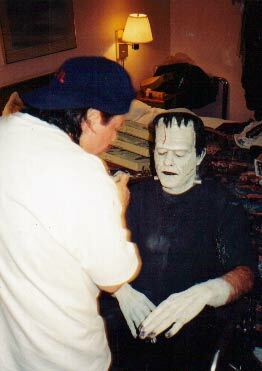 Monster Bash Make-Up man Ron Chamberlain "dusting off" his monster (Frank Rios)! Jane Adams (the hunchbacked nurse in HOUSE OF DRACULA) is dealing with monsters again! The "Bela" cake free to Bash goers on Saturday night. 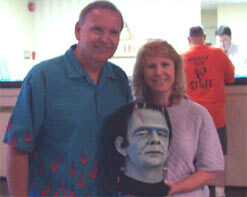 Tami and The Count (Ron Chamberlain) serve it up!